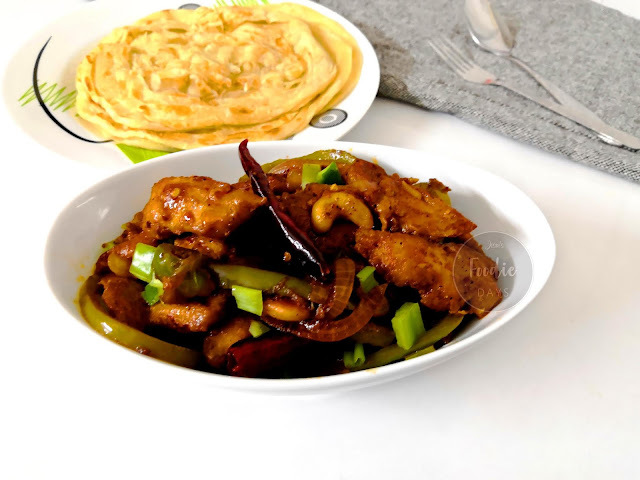 Dragon chicken | Indo chinese Dragon chicken recipe. Today I am sharing a famous Indo Chinese dish called Dragon Chicken. Chicken strips marinated, fried and sauteed in a spicy and tangy sauce. This is one of my favourite Chinese side dishes. Serve dragon chicken as an appetizer or as a side dish with chicken fried rice or vegetable fried rice or Singaporean fried rice. Try this recipe and give your feedbacks..
Chicken Boneless-500 gms, cut into thin strips. Red Chilli sauce- 1 Teaspoon. Dried red chillies-3 to 4 numbers. Cashew nuts-10 to 15 numbers, Split. Capsicum-1 Large, Cut in lengthwise. Spring onion greens- 2 tablespoons, chopped. Clean and cut the boneless chicken into thin strips. Take this cleaned chicken in a large bowl. Now heat a pan with enough oil for frying the chicken. Fry the chicken pieces in hot oil till golden and crispy. Remove from the oil and keep this aside. Heat the same oil ( we need only 2 tablespoons) or you can use fresh oil. Add finely chopped garlic, dried red chillies and cashew nuts. Saute this for few seconds. Add sliced onion and capsicum. Saute this in high flame for 1 minute. Add in red chilli flakes and mix it well. Add salt to taste. Mix this well. Add soy sauce, tomato sauce or ketchup, red chilli sauce, black pepper powder and red chilli powder. You can adjust spices according to your taste. Add a teaspoon of sugar and mix it nicely. Now add a cup of chicken stock. or you can add water. Mix well and boil until the sauce thickens. Add the fried chicken pieces and toss it well. Cook for 1 minutes and finally add chopped spring onions and mix well.